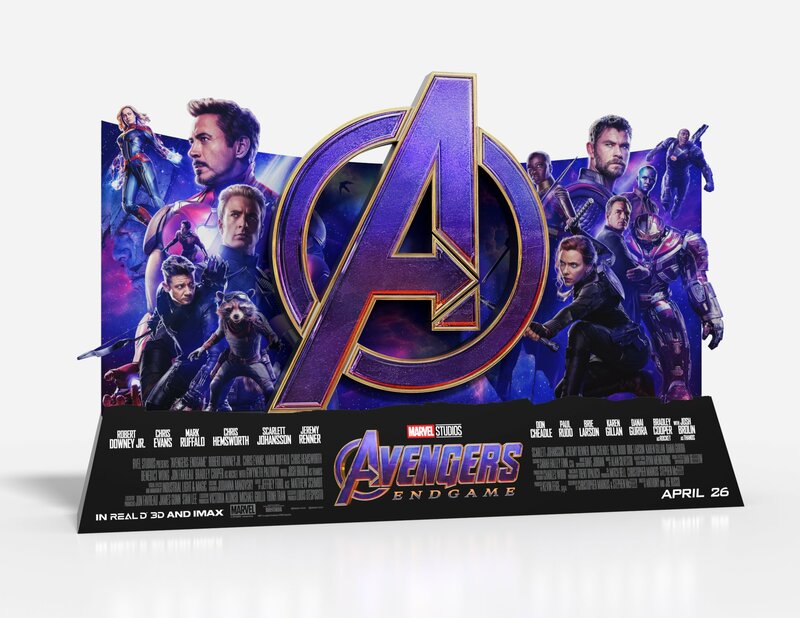 It’s been a busy few days for Avengers: Endgame promotional material, and one of the first pieces of advertising to drop this week was a giant standee that’s started showing up in public places. Now, courtesy of Drissi Advertising, we have a hi-res version of the design, which offers a better look at the new Hulkbuster armor and the rest of the team. To some extent, this standee’s content is already a little behind the times, in that Marvel has since released a couple of posters that confirm Valkyrie and Wong to be part of the line-up. Still, the below image is looking packed enough as is, cramming Earth’s Mightiest Heroes on either side of a massive Avengers “A” that calls to mind Thanos with its purple-and-gold color scheme. To a large extent, the layout is a variation of the same design that featured on an international Endgame poster that dropped last week. In fact, the Hulkbuster armor has already been the subject of a little speculation from fans wondering who might be in the suit. While Bruce Banner may seem like the most obvious guess, since he also depended on the Hulkbuster in Avengers: Infinity War, there’s still a case to be made for Tony Stark or even no one at all wearing the suit. Regardless, while Marvel seems to have stopped releasing new footage for the time being, it looks like the studio is ready to take their marketing to the next level. This past Tuesday, for instance, saw the release of 32 posters that teased over a dozen returning heroes, while also honoring some recently deceased characters. You can expect plenty more promotion in the coming weeks, too, before Avengers: Endgame hits theaters on April 26th.